Rich color scheme and dramatic typography makes this shirt pop! Go To Hell Shirt features a unique typography design and a regal color scheme that is very fetching. 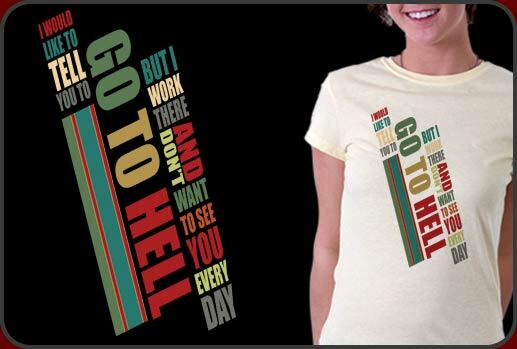 The Go to hell shirt is a new typography re-creation of an old classic t-shirt we used to feature saying "I would like to tell you to go to hell but I work there and don't want to see you every day"
Fans of Kinetic Typography videos on the internet will find the design of this Go To Hell Shirt familiar and eye-catching. Our Go To Hell Shirt is available in mens and womens shirt styles and we have some very cool gift items avialablel in this design as well. Go To Hell Shirt prints beautifully on either light or dark color shirts so you can choose from over 12 diffferent color combinations.